This deconstructed sushi bowl is one of my all time favorites! It’s wasabi roasted tofu, avocado, carrots, cucumber and brown rice, all topped with a Siracha mayo, and served with pickled ginger sesame seeds and micro greens. And it is beyond yummy! It’s super easy to make… The tofu marinates and roasts for a total of 30 minutes, the rest is a little chopping and quick mixing of a mayo. The Sushi Bowl inspiration and recipe is adapted from Pinch of Yum. The recipe for the Wasabi Roasted Tofu is from Vegetarian Times. 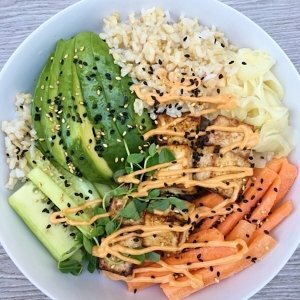 This deconstructed sushi bowl with Wasabi Roasted Tofu and Sriracha Mayo is out of this world! Packed with flavor and so satisfying, it also extremely easy to make. The Sushi Bowl inspiration and recipe is adapted from Pinch of Yum. The recipe for the Wasabi Roasted Tofu is from Vegetarian Times. In each bowl, place brown rice, tofu, carrots, cucumbers, avocado and pickled ginger. Drizzle with mayo. Top with sesame seeds and micro greens.